1. In One Flew Over the Cuckoo’s Nest, which won Best Picture in 1975, what is the first thing the chief says? 2. The 1976 Best Picture winner was Rocky. What is the name of the loan shark that Rocky worked for, played by Joe Spinell? 3. What is the name of the ship that picked up all the surviving passengers of the Titanic? 4. What beverage does Forrest Gump drink several bottles of before he meets John F. Kennedy? 5. Oliver Reed Plays Bill Sykes in what Best Picture? 6. What Best Picture winner has the famous hitchhiking scene where the female lead lifts her skirt to stop a car? 8. In the 2001 Best Picture A Beautiful Mind, what college did John Nash attend? 9. Who played Mozart in Amadeus? 10. Which star of classic horror films played the police captain in Casablanca? 1. What was the first movie to ever win an Academy Award in the Production category in 1927? 2. Name 2 out of the 3 films that won the top five Oscars which include Best Picture, Best Director, Best Screenplay, Best Actor, and Best Actress. 3. What film did Meryl Streep win her first Oscar for? 4. Name two of the three Best Picture winners who received 11 Oscars. 5. Name 2 of the 11 films that have won Best Picture without a single acting nomination. 6. Name one of the two films to hold the record for most nominations. 7. Name one of the two films whose Best Director Oscar is shared between two people. 8. Name the most recent film for which the lead actor and actress were both nominated. 9. 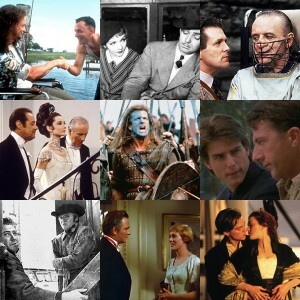 Name the two film trilogies that have nominations for Best Picture with each installment. 10. Name three of the four films to win Best Picture and Best Song. 1. What breakfast food does Ted Kramer learn to make for his son Billy over the course of Kramer vs. Kramer? 2. What’s the only X-rated film to win Best Picture? 3. Which star from One Flew Over the Cuckoo’s Nest appears as himself in another film from the same director? 4. Where does Raymond Babbit buy his underwear in Rain Man? 5. What are the three sequels that have won Best Picture? 6. The Departed is a remake of what Hong Kong film? 7. What actor forgets his mantra in Annie Hall? 9. In Last Action Hero, Danny Madigan is suspicious of FBI agent John Practice because of his performance in what Best Picture winner? 10. Who is the third Musketeer? 1. This Englishman won Best Actor for his portrayal of a famous world leader in this Best Picture winner. 2. The producers loved the script of this film so much, they offered the first-time writer $125k for it. The author insisted on starring in it and left the room after the producers wouldn’t even think about it. They called him back offering 250k and then 325k to not star in the film before finally compromising and giving him 35k for the script and to star in it. 3. Gary Cooper turned down the role of Rhett Butler and was passionately against this film saying, “This is going to be the biggest flop in Hollywood history and I’m just glad it’ll be Clark Gable who’s falling on his face not Gary Cooper. 4. This B-Movie was originally planned for a spring release until the allies landed in Africa in November. To capitalize on this, the studio, in the middle of reshooting the ending, rushed it into release that same month. 5. This Best Picture winner nearly went straight to DVD. 6. This film is reportedly the longest film to not have any dialogue spoken by a woman. 7. This film was the first remake to win Best Picture… it was also the only Hollywood film to be included on the Vatican-approved film list in the category of religion. 8. This film was shot in chronological order so that the actor could better represent the character’s deterioration and progressing manner of behavior. 9. The eventual director of this film first approached, as a producer, Martin Scorsese, Roman Polanksi, and Billy Wilder to direct this film, feeling that he wouldn’t be able to do the film justice. 10. Though the film uses many lines from Shakespeare’s established works, he receives no credit, or even thanks, in the credits of what film? 1. In Gone With the Wind, though she gets married three times throughout the story to other people, what is the name of the only man Scarlett O’Hara truly loved? 2. While Citizen Kane is routinely voted the Best Film of All-Time, when it came out in 1941 it was not widely considered a masterpiece, what John Ford film to home Best Picture that year? 3. Directed by Delbert Mann only one winner of the Palme D’Or at the Cannes Film Festival has gone on to win the Academy Award for Best Picture, what is it? 4. From the song “Maria” in The Sound of Music, can you name one of the other conundrum questions the nuns bring up in the song? 5. In Annie Hall, who is the author that Woody Allen pulls out of a crowd to shut up the pretentiously pedantic man in the movie line? 6. In Gandhi, what actress who eventually went on to a major award winning sitcom that she starred in, appeared? 7. What does the title Rainman refer to? 8. In Forrest Gump, what comic turned down the role of Bubba because he believed it would be a huge flop? 9. Two Best Picture winners have famous scenes in which a boy jumps into the waste pond of a toilet, name them. 10. Name five of 12 Director’s who have directed multiple Best Picture winners. 1. One story about this film, states that the Buddhist Monks who appear in the film could not be touched by women, so extra male wardrobe assistants where hired to dress them. 2. It’s a shock that this film, which has only one astronaut in it, beat The Right Stuff, with seven astronauts for Best Picture. 3. Daphne du Maurier wrote this Best Picture winner, one of the two stories she wrote for the same director. The lead actor of this film also won a Best Picture Oscar. 5. Paul Newman was originally considered for the lead in this Oscar-winning crime film, and considering his obsession with fast cars, he might have been a better choice. 6. This STARK Best Picture winner is loosely based on the life of a notorious Southern politician who practically WILLed his way through a checkered political career. 7. This film, titled after it’s main character, is both the shortest winning film to date and the first and only Best Picture winner first made as a TV movie. 8. This Oscar winner started the classic motion picture cliche of people walking while neon signs float by. 9. Karen Blixen was the real name of the Danish author who wrote the source material for this 1980’s Best Picture winner. What is the film and the pen name? 10. These two Best Picture winners, winning 35 years apart, both went up against films titled Heaven Can Wait. 1. What My Fair Lady surname, reappears three years later in another Rex Harrison film? 2. What NFL commentator shares his name with the main character of a Best Picture winner? 3. How is it suggested that Jack Lemmon’s character serves meatballs in Billy Wilder’s The Apartment? 4. Chicago was the 2002 Best Picture winner. Before Chicago, what was the most recent musical to win? 5. Marilyn Monroe only appears in one Best Picture, name it. 6. Meryl Streep has two genuine reactions in Kramer vs. Kramer. One is when she asks how her eye make-up looks. What is the other? 7. Bing Crosby often plays the love interest. What contrasting role does he play in Going My Way? 8. When Rick says, “You played it for her, you can play it for me. Play it, Sam” in Casablanca, what song is he referring to? 9. What tribe of Indians does Kevin Costner character in Dances With Wolves become drawn into? 10. How does King Wesley arrive at his wedding at the end of It Happened One Night? 2. It Happened One Night, One Flew Over The Cuckoo’s Nest, and Silence of the Lambs. 4. Ben-Hur, Titanic, and Lord of the Rings: Return of the King. 5. Wings, All Quiet on the Western Front, Grand Hotel, An American in Paris, The Greatest Show on Earth, Around the World in 80 Days, Gigi, The Last Emperor, Braveheart, Lord of the Rings: Return of the King, Slumdog Millionare. 6. All About Eve and Titanic. 7. West Side Story and No Country For Old Men. 8. Silence of the Lambs. 9. Godfather and Lord of the Rings. 10. Gigi, Titanic, Lord of the Rings: Return of the King, Slumdog Millionare. 8. Climb a hill, leave me all your will, fight my Bill, wear a daffodil, shine my shoe, paint your face bright blue, catch a kangaroo, go to Timbuktu. 4. How do you catch a cloud and pin it down, How do you find a word that means Maria, How do you keep a wave upon the sand, How do you hold a moonbeam in your hand? 7. It’s how Charlie used to say Raymond growing up. 10. Frank Lloyd. Frank Capra, William Wyler, Elia Kazan, Vincente Minnelli, Fred Zinnemann, Robert Wise, Milos Forman, Billy Wilder, David Lean, Francis Ford Coppola, Clint Eastwood. 3. With a tennis racket. 6. When Dustin Hoffman shatters a glass against a wall at lunch. 8. As time goes by.